Recumbent bikes have been a staple of many people’s homes for years. As people become more health-conscious, they realize the importance of exercising even into their late years. 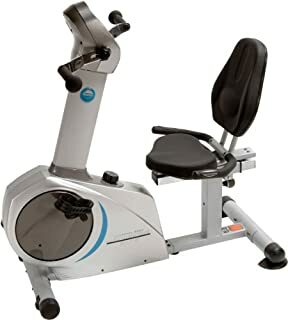 The comfort of a seatback and the low-impact nature of recumbent bikes make this an excellent option for anyone looking to get a light workout in. If you want to exercise but want something more laid-back (literally) and easy to do, a recumbent bike is probably the best option for you. So I want to show you the best recumbent bikes on the market today. You’ll be shocked at how easy it is to keep your health in check. 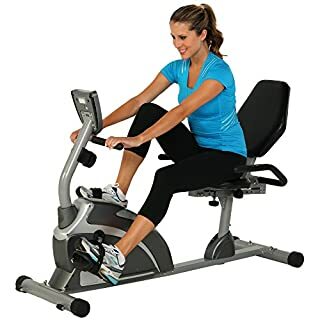 A recumbent exercise bike is a bike in which the seat is placed low to the ground, usually with a backrest, with the pedals place out in front of you. This is a more comfortable position for the body to be in and lowers weight bearing on certain points in the body. Overall positioning of the body on recumbent bikes is conducive to healthy body alignment. Easy on Lower back. On regular upright bikes, you’re forced to lean forward to hold the handlebars. This places added stress on your lower back, not to mention a number of other areas on the body. 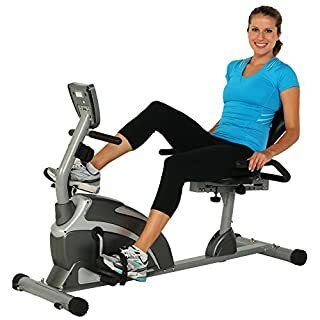 Top rated recumbent exercise bikes get rid of this issue entirely because you are sitting and leaning on a backrest with ample support. Gentle on Joints. Upright bikes also require most of your weight to be distributed over your legs. This adds more impact and wear to your hips and knees. Recumbent bike seats take the weight off those joints. This is why many people with knee issues find recumbent bikes great for riding without added discomfort. Safe. Since recumbent bikes are low to the ground, there’s less chance of injury. It’s also safer because your weight is not distributed over one plane of balance. You get a wide girth (seat back and bottom cushion). Hardly any core strength is needed to keep balance. Makes Leisurely Activities Easy. True, you’re able to watch television while riding a regular upright bike, but it’s not the most comfortable. Since you’re sitting in a slightly reclined position on a recumbent, you’ll be able to do a number of leisurely activities while working out! Watch TV, read a book/article, talk on the phone, text, knit, even eat if you want! Many people even like to place a tray table over their laps (as long as their knees don’t knock it while pedaling) and get some work done. Now that you know how great a recumbent bike is, I’m sure you’re ready to look at some of the best options. And, boy, am I ready to show them to you! We have the best recumbent exercise bike reviews here. I’m sure you’ll find an option that’ll work great for your needs and lifestyle. 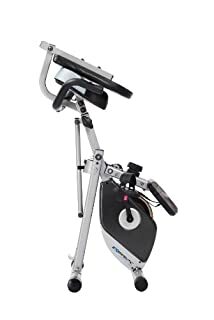 Stick around after the bike reviews for a buyer’s guide where I’ll go into what you’ll need to consider when buying your recumbent bike. For now, let’s get into the top rated recumbent exercise bikes. 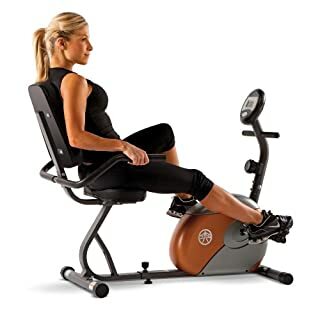 The best recumbent exercise bike was made by our favorite sports equipment company, Exerpeutic. This bike has everything you could want from a recumbent bike for a nice price point. This machine is exceptionally quiet with V-belt double-drive transmission system. The precision-balanced flywheel gives excellent weight for those higher resistance levels. I know, I said the magic words “Resistance levels” and now you’re wondering how this bike does in that arena. Well, you won’t be disappointed. There are 8 levels of resistance with the lowest levels being great for beginners and the higher levels great for those who want a challenge. As far as comfort goes, Exerpeutic has made the seat and backrest well-cushioned and oversized for your biking pleasure. This is a semi-recumbent bike so you won’t be as far back from the pedals as you would a traditional recumbent bike. That nice middle ground between recumbent and upright is great for getting a more solid workout. Oversized pedals with safety straps make these great for anyone’s feet. Leg stabilizers are also placed at the bottom of the equipment so there will not be any wobbling even at faster speeds. All of these great features and I haven’t even mentioned the LCD monitor yet! It’s simple, tracking your distance, calories, time, and speed. If you hold the hand pulse sensors on the handlebars, you’ll see your heart rate as well. This bike can fit any user between 5’2″ and 6’2″, and up to 300 lbs. of weight. That’s a heavy-duty, durable machine. As durable as it is, you’ll find it easy to tuck away with its folding feature and transportation wheels. They made everything easy for you. The only thing you might have trouble with is the setup. The manual may not have the correct directions for setup, but if you like a building challenge, you could probably figure it out on your own. Otherwise, call your local builder. In a similar capacity, Marcy has crafted a sturdy, well-made best recumbent stationary bike to contend with Exerpeutic’s. This bike was built with larger users in mind, with a weight of 66 lbs. and leg stabilizers to keep from tipping. This is a true recumbent bike with the seat low to the ground and the pedals out in front of you. This is what recumbent bikes are made for: the low-impact, comfort level for those joints and sensitive leg areas. This easily holds up to 300 lbs. It also has a convenient step-in design. There won’t be any climbing over or hoisting ourselves up onto this bike. Eight levels of magnetic resistance are offered with this model. Just turn with a knob and you’re all set. The eight resistance levels cater to all riders, from rigorous trainers to leisurely riders. Riders have known this bike to ride smoothly with no teeter-tottering or jerky pedaling. Even at higher speeds, this bike does not falter. An LCD screen displays time, speed, distance, calories burned, as well as heart rate if you use the sensors on the handles. The seat itself if pretty comfortable, but the backrest is not adjustable. Shorter users may find adding a pillow will allow them to sit comfortably and reach the pedals. All tools are sent to you to help you assemble this equipment. Most users will find that they can assemble this independently within an hour. This is also easily transported using the transportation wheels on the back. I do wish it were able to fold for more storage capability. This may not be the best option for those looking for space-saving bikes. Overall, Marcy makes a well-designed durable bike that is meant to last users a long time, if not forever. The Marcy brand has always been known for their quality equipment, and I think this one is no exception. Exerpeutic is back again with another recumbent bike. This model boasts an extra-large back support that is adjustable as well as other key features. Even more heavy-duty than the Marcy model mentioned before this, this bike is able to hold up to 325 lbs. of weight easily, while still being transportable. With magnetic resistance, you can be sure that this will not wake anyone if you decide to ride early in the morning or late at night. Eight levels of resistance are offered which can be changed manually. Everyone from beginners to advanced users can find a level that suits them well. This model still has the same precision-balanced flywheel with V-belt drive of the first model. This is coupled with the smooth torque cranking system, so you won’t have to worry about any stop-and-go as you pedal. Leg stabilizers also keep the bike stable on any surface. Exerpeutic has seemed to have made an adjustment of this seat more difficult than necessary. Unscrew three stabilizers then rescrew them to fully adjust the seat. Riders who don’t plan on sharing this bike will not find this feature too cumbersome. Some users may find the seat is a bit too firm. Gel cushions and seat covers can solve this problem easily. I also wish this bike folded, but it has transportation wheels at least so you can move it out of the way. All in all, this is a durable bike able to handle larger users. You’ll find a well-balanced ride on the 900XL. Heavy duty- holds up to 325 lbs. Remember those bells and whistles I was talking about earlier? The Schwinn 270 Recumbent bike is PACKED with them. Let’s start with the console. Dual track LCD window system allows you to see up to 13 different readings at the same time. Your workout data is easily transferable using Schwinn Connect or fitness apps like MyFitnessPal. This makes it easy to track your progress and stay motivated. Besides that, the console comes with 29 preset workout programs. Not only that, you can set up four users by name, and it’ll track each person’s data. There’s a USB charger for your electronic device, and a nook where you can set said electronic device. The dual screen allows you to see your readings even with a device on the nook. The USB charger also connects to the integrated speakers to blast your music while you ride. I haven’t even gotten to the actual bike yet. Hold on to your hats. There’re a whopping 25 levels of adjustable magnetic resistance. A nicely weighted flywheel keeps the bike well balanced. The seat bottom is nicely padded with the leg area contoured for a perfect shape. A large back seat is vented to allow cool air to pass through. The seat is adjustable (forward and back) with one lever. For all its many features, this bike is in a good price range. You won’t come across many recumbent bikes with as many features as this Schwinn within the high price range. There are a few things to keep in mind about this bike. Since it has so many features, you’d think the bike would come with a User Manual. But, alas, you’re left on your own with all of the buttons. 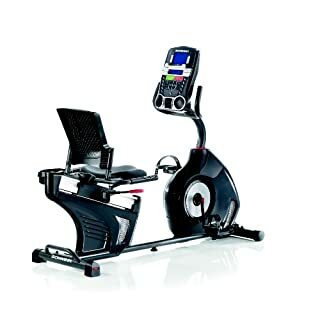 You can download Schwinn 270 Recumbent Bike Manual from here. 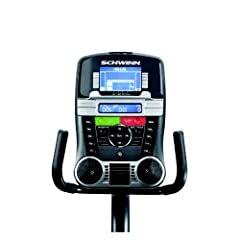 If you’re the type of rider who likes to track their progress and a variety of workout options with one equipment, this Schwinn is probably the way to go. Coming from the feature-heavy Schwinn bike, the Stamina Elite Total Body Recumbent Bike may seem overly simple in comparison. But it still boasts all of the key features you would need for a good ride. The real kicker that puts this bike at the top of the list is the ability to work out your arms with the added hand pedals. That’s right, you can work out both your lower and upper body at the same time if you please! This means added strength to your back, shoulders, and arms, which is not something you’d expect to find on a recumbent bike. It is important to note that it is possible to knock your hands against your knees as you pedal both, so a bit of coordination is involved. Eight levels of resistance make for as challenging of a workout, as you need. Note that only the leg pedals give resistance when both hand and leg pedals are used simultaneously. The levels on this bike are not extremely strenuous either, making it the best recumbent bike for seniors. A multi-function monitor shows your speed, calories, distance, and heartbeats per minute one readout at a time. Changing from one resistance level to the next is smooth and seamless. You also don’t have to get up to adjust the seat. Speaking of the seat, it is nicely padded and easily adjustable. It adjusts both forwards and backwards to find your perfect fit. Easy and entry and exit are made possible by the low step-through design. A steel frame makes this a stable piece of equipment. Wheels have been added for easy transport, yet again there is no folding feature. This is missing any nook to put your device on, and it would be nice if the screen were backlit for when we’re working out in dim light. 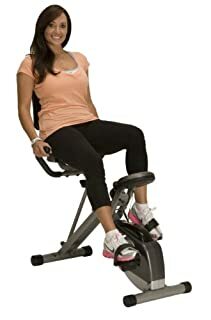 But overall, this is great for the moderate-use exerciser looking to burn some calories, and perhaps even get an arm workout in. 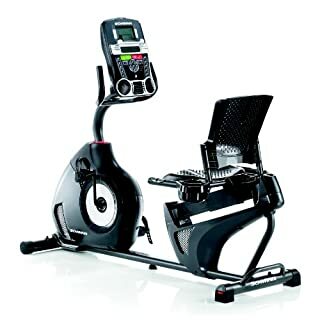 If you’re looking for a standard exercise bike with all of the basic capabilities, this folding recumbent bike may be a good option for you. This bike has the best storage capability of any bike in this list so far. It folds up to practically half its’ size, easily fitting to a closet for storage space. Love it! This is a semi-recumbent bike so you won’t be getting as much joint relief as with a standard recumbent. But, this bike has handles back near the seat and towards the front, so you can use this both as a slight upright and slight recumbent. You get to choose. Magnetic resistance keeps this bike smooth and quiet while in motion. This bike is easy to assemble within an hour and is made of a sturdy steel and plastic frame. Like I said, this bike is for people who want a standard exercise bike with basic capabilities. You won’t find the highest resistance levels very challenging if you’re an avid rider. But for those of us who want a moderate steady workout, this bike works just fine. The seat can be uncomfortable if sat on for a long period of time. You’ll notice that this is a common downfall of a lot of exercise bikes. A padded seat cover can help with this issue. Those within an average height range- between 5’4-6 ft. should be able to fit this bike just fine. Unfortunately, this bike doesn’t cater to the shortest and tallest ends of the height spectrum. This bike is at a great price. Very affordable and well-made, this exercise bike will get the job done. For more advanced riders, you may find the Schwinn 230 Recumbent Bike works better for you. Lots of resistance as well as program options will keep you motivated and on track to a stronger body. This model is similar to the 270. It has 22 pre-programmed workouts, goal tracking, and 20 levels of resistance. A USB port is available for charging and speaker capability to blast your music. The most noticeable difference from the 270 model is the seat. It is made of hard plastic, with both a wide bottom seat and a backseat. The contouring of the large seat can be nice if your body fits perfectly, but some may find the plastic slippery, hard, and uncomfortable. Finding a seat cushion large enough can be tricky, so the seat is really hit or miss. As a plus, both parts of the seat have ventilation holes to keep you cool. It can carry a user weight of up to 300 lbs. with its sturdy steel frame. The bike as a whole is rather large. There are transportation wheels, but no folding capability. If you have a smaller apartment space, this may not be the best fit for you. If you’re able to get past the drawbacks, then this is an excellent bike with a lot of great extras that you won’t get from a simpler bike. Do you like pink? Would you like a bike in this color? 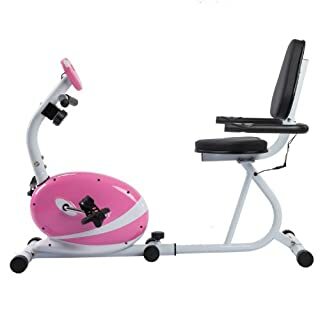 Then you’re in luck with the Sunny Health and Fitness Pink Magnetic Recumbent Exercise Bike. This bike seems to be geared toward the female market with the pink body and capability. It’s only able to handle up to 220 lbs. of weight and doesn’t have super high resistance capability. This bike is also better made for those on the shorter side. This bike is easily assembled independently and makes for a simple, durable bike. Tension, seat, and pedal straps are fully adjustable. An eight-level magnetic resistance system keeps this bike quiet for those early morning workouts. Double direction flywheel makes this good for both forward and backward pedaling. The seat is comfortable (unlike the one prior) which is well padded with a vinyl cover and foam. There is an LCD display, which tracks those key readings we want, yet there’s no way to track your progress. If you don’t need all the extras, this bike is stable and reliable. You can expect to use this for years and years to come. A pretty good warranty backs Sunny Health products, so if things do start to break down, you’ll be sure to get it fixed right away. For beginners, this bike from Stamina is a great option. It is a quiet, low-maintenance bike that has all of the simple accessories needed to get a good workout done. This bike can bear a weight of up to 250 lbs. so it is not meant to be heavy-duty. As a whole, the bike is the lightest in the list, clocking in at a mere 58 lbs. Transporting wheels make it easy to transport from room to room. I like that the pedals are weighted plus oversized for the larger surface area for your feet. This is probably to make up for lack of pedal straps. The seat covered with vinyl on both the seat and seatback, and you’ll be able to adjust both parts of the seat for a perfect fit. There are handrails that you can hold on to if necessary. At higher speeds, some may find this bike wobbly. If you keep the pedaling to a low level of moderation, this bike will be stable enough. If you’re not big on the bells and whistles and want something easy to use for your moderate workout without breaking the bank, this is a great option. Lastly, we have the ProGear 190 Compact Recumbent Bike. This bike wins in simplicity and affordability as well but comes in a semi-recumbent style. This bike is easily assembled out of the box. It’s able to hold a weight capacity of up to 275 lbs., which makes this a little more durable than the last model. Semi-recumbent bikes usually have pretty good storage capability, and this is true for this model from Stamina as well. It folds up to half its size and is able to be rolled and tucked away in a corner. Eight levels of magnetic tension combined with the high torque smooth crank system make exercising on this bike smooth and quiet. Pedal straps keep you stable, and the display shows your key readings. The seat cushion and backrest are large for plenty of support. Some users may find it more comfortable to add lower back support by adding a pillow to the bottom of the backrest. Also, be aware that the large seat may brush against your thighs while you pedal depending on your height. This bike at its’ low price point is a steal, but keep that in mind when assessing the durability of the bike. It may not last you a long time depending on how often and how rigorously you’re using it. 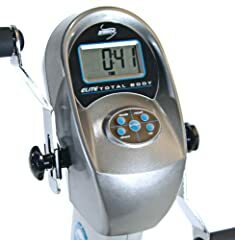 After seeing the recumbent bicycle reviews, you realize there are lots of things to consider when buying a recumbent bike. Overall, you’ll want something that will help aid you in reaching your health goals in a practical manner. Here are some things to think about as you peruse possible options. User Height and Weight Capacity. Exercise bikes come in all different shapes and sizes. So do we as people! Take a look at the design specifications to see which heights that bike is able to adjust for. Max weight capacity should also be listed. Number of Resistance Levels. Those that want a more rigorous workout will want something with a high number of resistance options, while those who are looking for something mild won’t need as many options. If you like to vary your resistance throughout your workout and are expecting ample progress to be made, more levels are preferable. Features to Consider. Heart rate monitor, LCD display, water bottle holder, progress tracking, media dock- these are all features. Features are basically extra accessories that can make your bike ride more enjoyable or convenient. Usually, the more features, the more expensive the bike is. Comfortable, Adjustable Seat. It turns out it’s relatively difficult to create a comfortable seat for bike riding. Try to find a bike that has done their best with the seat, and if you still find it uncomfortable, order a seat cushion or gel cover. Adjustability is also important so that you’re able to make your riding experience as comfortable as possible. Noise Level. Noise is a big concern for many riders, especially if you’re in a shared space or in close proximity to other people (like an apartment). Luckily, most bikes are made with magnetic resistance keeping sound to a minimum. All the bikes in this list have employed magnetic resistance. Warranty. For any piece of high-priced equipment, you’ll want to make sure there’s a warranty. Most companies cover manufacturing issues under their warranty. Check to see how long the frame and labor warranty is on your equipment before buying. Other Considerations. Storage capability may be important for some living in smaller spaces or who simply don’t want their exercise bike out in the open. Look for folding and transporting capability in this case. The brand name is important to consider as well. Look for exercise product companies that have been around for a while and who have a solid history of making quality products. In recumbent bikes, the rider’s body sits well into the bike frame. Recumbent bikes reduce body fatigue and eliminate muscle soreness in the upper body. The seat of a recumbent bike is typically as comfortable as the seat of an average office chair. On an upright bike, the cyclist sits above the bike frame. Riding an upright bike may cause muscle soreness and fatigue, because it encourages the rider to sit with their neck and back slightly bent. The upright back has a smaller seat that may cause aches and pains in the buttocks (so-called saddle soreness). Recumbent bikes are gentle on the joints, because the lower back is supported by the seat and the ankles and knees are protected. Recumbent bikes tend to be better for exercise, especially for people with neurological conditions, because it offers additional support and is suitable for people of all fitness levels. It’s also particularly safe for exercise because it provides a low-impact workout. Riding an upright bike engages the biceps, triceps and shoulders in a workout. It’s hard to determine whether recumbent or upright exercise bikes are more beneficial — each has its advantages and disadvantages. The answer really will come down to your particular cycling goals and concerns. I love recumbent bikes because they make exercising simple and easy. Easily turn a passive activity like reading, watching TV, even texting/talking on the phone into an active workout. Do this all without adding unneeded stress to your body. There aren’t any excuses left for you to get into shape and take control of your health. I’ve done the list of the best recumbent bike reviews for you! 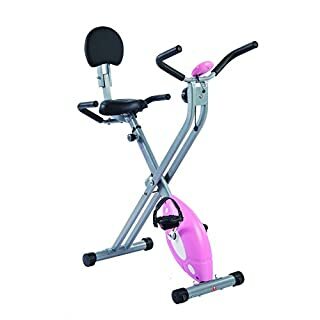 Buying an exercise bike could be one of the best things you could do to improve your happiness, health, and quality of life.